My interest in building and creating things most likely came from two sources. One was my father, who was a civil engineer. The other, my summers spent working in heavy construction while pursuing a degree in fine arts and education. I started out working in a small company manufacturing Euro-designed windows and doors here in Asheville, NC. I left to start my own business, Architectural Woodcraft. I saw a great opportunity to work not only in the restoration of buildings in Western North Carolina, but of new architectural designs, too. My goal is to create this finest finished product whether historic or contemporary. 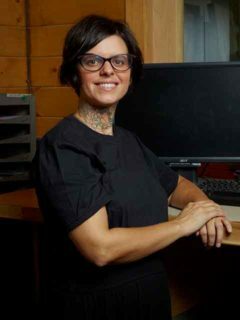 Heather “Sprout” Morgan came to work with Architectural Woodcraft in February 2017. Sprout has over 20 years of experience in administration, business management and accounting. She believes simplicity and reliability are the keys to success & provide us with the space to nurture our lives & our families. She grew up in the Heart of Texas, where her Father, Grandfather, Great-grandfather and Uncle were all stone masons. These men are her foundation & appreciation for construction and all things DIY. Her Mom, Sister and Grandma also have roots in administration, management and accounting. Sprout is excitedly expecting her first child in February of 2019 and resides in West Asheville with her cat. She also founded and continues to pour her heart into her own bookkeeping company and enjoys helping small businesses grow from healthy foundations. Sprout is so happy to be a member of the Architectural Woodcraft family. Growing up in western Massachusetts, Todd was exposed at an early age to home restoration projects, many of which date to the colonial period. His father, a welder by trade, spent 25 years restoring an old home which he had rescued from the brink of demolition. Helping his father on that project created a love for old homes and woodworking that allowed him to get experience in various fields of construction from timber framing to cabinet making. After moving to Asheville, Todd spent two years working for a builder of custom homes before joining the Architectural Woodcraft team. Todd’s can-do attitude makes him equally valuable in the field restoring vintage windows or in the shop producing doors and cabinets. When not working, Todd spends his free time with his family and building motorcycles. For as long as Matt can remember he has been immersed in the woodworking craft. Starting at the age of three he watched his father craft a sixteen foot sailing dory unaware that the seeds of a lifetime of woodworking and carpentry had been planted. At the age of sixteen, following in his father’s footsteps he built an ultra-light canoe and various other projects throughout high school. In 1990 he attended Ferris State University in Michigan to pursue a degree in construction management. 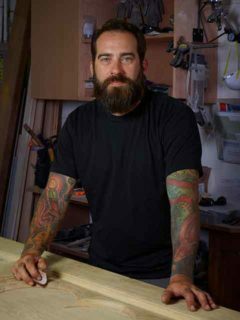 Matt came to find his passions lay more in the woodworking craft he had loved throughout his life, rather than the broader field of construction. After a few years of traveling in a 1973 VW Beetle he landed in the great town of Asheville in 1994. 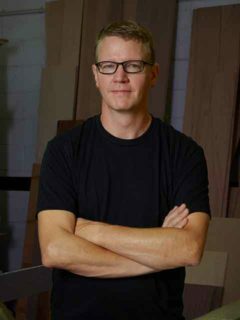 Over the last 24 years he has put his heart and soul into designing and building custom cabinetry, furniture, doors, windows, and wood products throughout Asheville. Shane attended Haywood Community College’s Professional Crafts for Woodworking program. He has been a cabinetmaker for 15 years, and has done many unique and custom projects. His other interests are riding his classic motorcycle. And tipping a pint from time to time. Roderick “Rod” Engleberg graduated with a BFA in designed objects and sculpture from the School of the Art Institute of Chicago. He then worked as a professional cabinetmaker and furniture maker in Chicago for 12 years, before settling down in Asheville with his wife, Alia, in 2017. 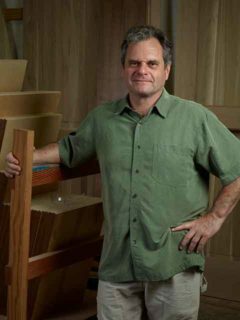 As a student, Rod, drew inspiration from furniture makers, such as George Nakashima, Sam Maloof and Wendell Castle. Rod loves the various ways in which wood can be freely manipulated. One can machine it precisely or sculpt it like an artist, but it always retains an inherent natural beauty. He’s always admired the skill and craft involved in working with wood as an ancient and timeless tradition. 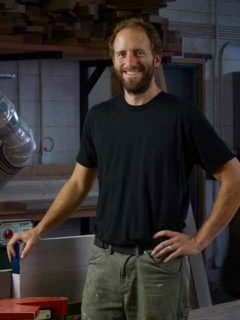 Ben White grew up in Massachusetts, the son of a carpenter, whose father was also a carpenter as well as a high school teacher. His father ran a cabinetry shop all his life, but Ben didn’t find the trade himself until the summer after his first year of college. 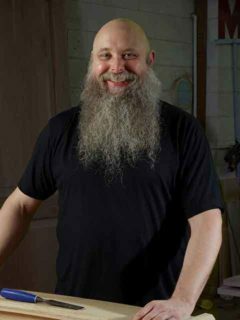 After taking a woodshop class as an art student, Ben found a passion for the creative potential of fine woodcraft. From that point onward, after moving to Vermont and changing majors to outdoor education, he continued to work for his father in between semesters, and paid his way through college at various building jobs. Eventually, he ended up finding more work in the outdoor adventure industry, but has always found various freelance work in the trade, like a short stint framing and roofing; helping people in the community repair barns or refinishing antique furniture in his basement. 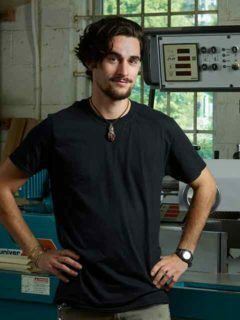 Ben moved to the Asheville area in the Spring of 2018 seeking more opportunities in the outdoor adventure industry, but inevitably found himself drawn back to carpentry work and found himself employed at Architectural Woodcraft, a familiar setting quite similar to his own father’s business. Clayton joined Architectural Woodcraft in early 2013. Originally from Ohio, he moved to North Carolina in 2004 to take classes/teach at the Penland School of Crafts in the glass medium. After a handful of years working in various glassblowing studios, Clayton moved to Asheville with his wife Amber, a metalsmith. In 2012 they bought a house from the 1920s and Clayton began working at Architectural Woodcraft soon after. Working with the skilled craftsman at AW has given Clayton relevant skills to renovate and add to his own home to accommodate two daughters. Clayton assists with restoration, finishing, installation, and anything else required to keep things moving as smoothly as possible!